Zine El Abidine Ben Ali, the President of Tunisia, had ruled the country since 1987. His government was characterized by the oppression of political opposition, therefore riots in Tunisia were quite rare. However, many people suffered from poor living conditions, unemployment, corruption, food inflation, lack of political freedoms. On 17 December 2014 a 26-year-old street vendor Mohamed Bouazizi committed self-immolation in protest of the confiscation of his cart and produce by a policewoman. This act sparked a series of street demonstrations. The wave of social and political unrest lasted for four weeks. On 14 January 2011 Zine El Abidine Ben Ali was ousted and fled the country. The Tunisian Revolution inspired similar protests in the Arab world which are referred to as the Arab Spring. 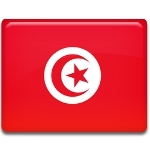 January 14 was proclaimed a public holiday in Tunisia. It was named Revolution and Youth Day as the majority of the protestors were young people struggling for the better future.